Battery material supplies; looking at dendrites; improved concentrating solar power receivers. Researchers at MIT, the University of California at Berkeley, and the Rochester Institute of Technology conducted an analysis of whether there are enough raw materials to support increased lithium-ion battery production, expected to grow significantly due to electric vehicles and grid-connected battery systems. They conclude that while in the near future there should be no limitations on battery manufacturing due to shortages of the critical metals they require. However, without proper planning, there could be short-term bottlenecks in the supplies of some metals, particularly lithium and cobalt, that could cause temporary slowdowns in production. Common battery ingredients like nickel and manganese are used much more widely in other industries, making increased battery production unlikely to cause supply problems. Others such as copper, aluminum, and some polymers used as membranes, are considered abundant enough that they are not likely to be a limiting factor. Lithium and cobalt are the two most significant materials whose supply chains could become limited. For those two elements, the team looked at the diversity of the supply options in terms of geographical distribution, production facilities, and other variables. For lithium, there are two main pathways to production: mining and processing of brines. Of those, production from brine can be ramped up to meet demand much more rapidly, within as little as six or eight months, compared to bringing a new underground mine into production, said Elsa Olivetti, assistant professor of energy studies at MIT. Although there might still be disruptions in the supply of lithium, she says, these are unlikely to seriously disrupt battery production. Scientists from Stanford University and the Department of Energy’s SLAC National Accelerator Laboratory have captured the first atomic-level images of finger-like growths called dendrites that can pierce the barrier between battery compartments and trigger short circuits or fires. The new images reveal that each lithium metal dendrite is a long, beautifully formed six-sided crystal – not the irregular, pitted shape depicted in previous electron microscope shots. This is the first study to examine the inner lives of batteries with cryo-electron microscopy, or cryo-EM, a technique where samples are flash-frozen by dipping them into liquid nitrogen, then sliced for examination under the microscope. The team examined thousands of lithium metal dendrites that had been exposed to various electrolytes. They looked not only at the metal part of the dendrite, but also at a coating called SEI, or solid electrolyte interphase, that develops as the dendrite reacts with the surrounding electrolyte. This same coating also forms on metal electrodes as a battery charges and discharges, and controlling its growth and stability are crucial for efficient battery operation. They discovered that the dendrites are crystalline, faceted nanowires that prefer to grow in certain directions. Some of them developed kinks as they grew, but their crystal structure remained surprisingly intact in spite of the kinks. Zooming in, they used a different technique to look at the way electrons bounced off the atoms in the dendrite, revealing the locations of individual atoms in both the crystal and its SEI coating. When they added a chemical commonly used to improve battery performance, the atomic structure of the SEI coating became more orderly, and they think this may help explain why the additive works. 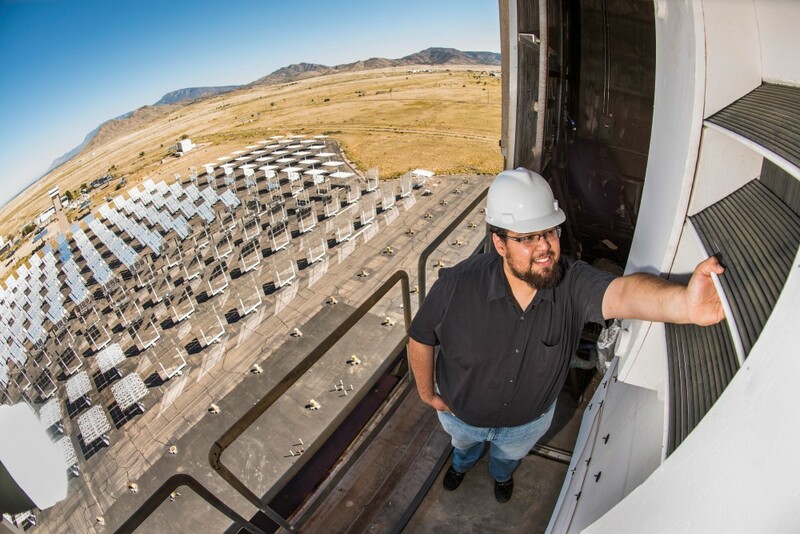 Engineers at Sandia National Laboratories developed new fractal-like, concentrating solar power receivers for small- to medium-scale use that are up to 20% more effective at absorbing sunlight than current technology. While most concentrating solar power facilities throughout the world are large, there is interest, particularly in India, in developing 1 megawatt or smaller facilities that could provide the appropriate amount of power for a small village or community. At Sandia’s facility, rows of mirror-like heliostats are aimed at a tall building with a central receiver installed at the top. The heliostats reflect and concentrate the sunlight on the receiver, which absorbs the sunlight’s heat and transfers it to gas flowing through the receiver’s paneling. The gas can then be used in a conventional power plant cycle to produce electricity or used with a storage system to be saved for on-demand electricity production when the sun is not shining. Conventional receiver designs usually feature a flat panel of tubes or tubes arranged in a cylinder. These designs can absorb about 80% to 90% of the concentrated sunlight directed at them when considering reflections and heat loss, but Cliff Ho, an engineer at Sandia, said design improvements to make the receivers even more efficient are needed to help reduce the cost of concentrating solar power and improve scalability. The team used an additive manufacturing technique called powder-bed fusion to print their small-scale receiver designs from Iconel 718, a high-temperature nickel alloy. Ho said this printing technique provided a cost-effective way to test multiple fractal designs at a small scale and could be used in the future to print entire sections of larger solar receivers. Sandia is evaluating the receivers’ performance with different gases by flowing air, carbon dioxide and helium through the receiver tubes with the ultimate goal of pairing the new receiver designs with supercritical carbon dioxide Brayton cycles. The term “supercritical” describes the semi-liquid state of carbon dioxide when it is heated above its normal critical temperature and pressure. A Brayton cycle functions by using the hot, pressurized supercritical carbon dioxide to spin a turbine.